In the sequel to Red Jacket, former Rough Rider turned Michigan game warden Lute Bapcat sets out to find a deputy warden who has disappeared from Ontonagon County, one of the Michigan Upper Peninsula's most lawless places. Merely hours into his search, Bapcat is shot by assailants unknown. After a miraculous rescue and recovery aided by mysterious caretakers, Bapcat uncovers a plan by powerful locals to capture and sell bears to zoos around the country, an act akin to theft in Bapcat's mind. The game warden's determination to break the scheme ratchets up when it seems his missing colleague may have authored the idea and employed the help of an outlaw called Red Hair, who had been raised in the same orphanage with Bapcat. Red Hair's gang of thugs have long terrorized the region. Bapcat must use all of his woodcraft to brave the Trap Hills and Porcupine Mountains to face the criminals at the old Nonesuch Mine. Zakov the Russian Bapcat's eccentric game warden partner is brought in to help with the hunt, which causes Bapcat to reevaluate his personal values. In classic Heywood style, an extraordinary band of Upper Peninsula characters collects around intrepid woods cops. Joseph Heywood is the author of The Snowfly and Covered Waters (both Lyons Press), The Berkut, Taxi Dancer, The Domino Conspiracy, the nine Grady Service Mysteries, Hard Ground: Woods Cop Stories, and Red Jacket (A Lute Bapcat Mystery). 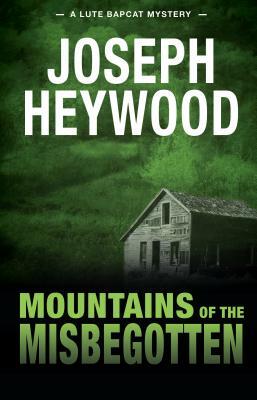 Featuring Grady Service, a contemporary detective in the Upper Peninsula for Michigan's Department of Natural Resources, and Lute Bapcat, a Rough Rider turned Michigan game warden in the 1910s, Heywood's mystery series have earned its author cult status among lovers of the outdoors, law enforcement officials, and mystery devotees. Heywood lives in Portage, Michigan. Visit the author's web site at www.josephheywood.com.